Kindred's first book is set in a blessed half-light—a South Carolina evening fragrant with apples, the "boiling quiet" of a kitchen, or, in a series of poems inspired by Noah's story, the crowded hold of an ark, where adders lurk in the warm straw. These densely resonant poems testify to danger and grief, but they also smolder with love, gratitude, and awe. Having endured her own flood of "wolf-colored waves," and fully acknowledging how predatory the world can be, Kindred plants herself on earth and insists, "Survive with me." In her debut collection, No Eden, Sally Rosen Kindred finds amidst the broken world of grief and loss and longing the promise of a lost heaven. These poems, exquisitely tuned by the poet's meticulous and luxuriant ear, at once demotic and scriptural in their music, evoke with equal vibrancy the great sorrows of childhood and the poet's wonder at the world's unbridled fruitfulness. “God / may or may not be there, in the firm grasp / through the cloven air, the whisk of leaves,” she writes in “American Sweetgum.” Hers is a vision that relishes the presences of things as well as their kindred relationships in a wider immanence that transcends us but of which we are irreducibly a part—her name bespeaking the living source behind the work. This is a poetry of lush anointings. No Eden is available from Mayapple Press, SPD, and Amazon. 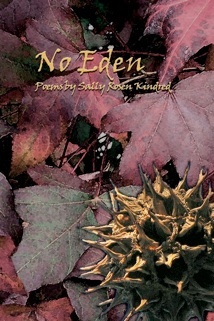 Poems from No Eden appear on-line in Blackbird, Gulf Stream, Literary Mama, and on Verse Daily. Reviews appear in NewPages (by Sima Rabinowitz), Weave Magazine (by Andrew Mulvania), Gently Read Literature (by Cherie Walsh), Ruminate (by Josh Mayo), and Umbrella (by Sherry Chandler).